Solve Your Toughest Cases — FAST! Genetic Genealogy: Identify a subject by matching their DNA to one or more family members. DNA Phenotyping: Predict physical appearance and ancestry of an unknown person from their DNA. Kinship Inference: Determine kinship between DNA samples out to six degrees of relatedness. 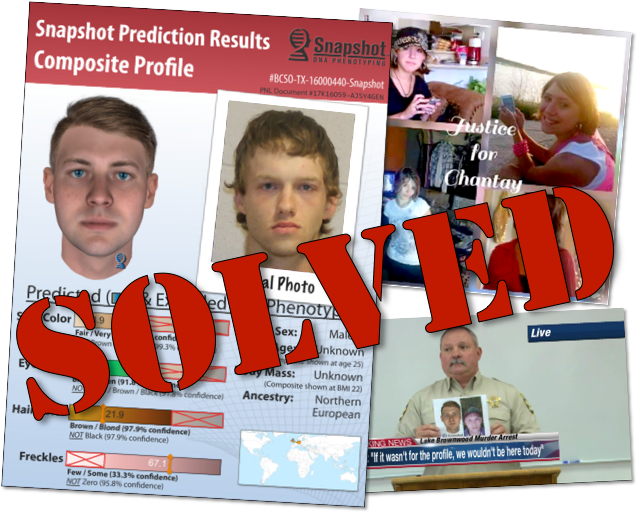 Snapshot is ideal for generating investigative leads, narrowing suspect lists, and solving human remains cases, without wasting time and money chasing false leads. Starting with extracted DNA or biological evidence from your case, we will perform a genetic genealogy screening to determine if such analysis would be helpful. 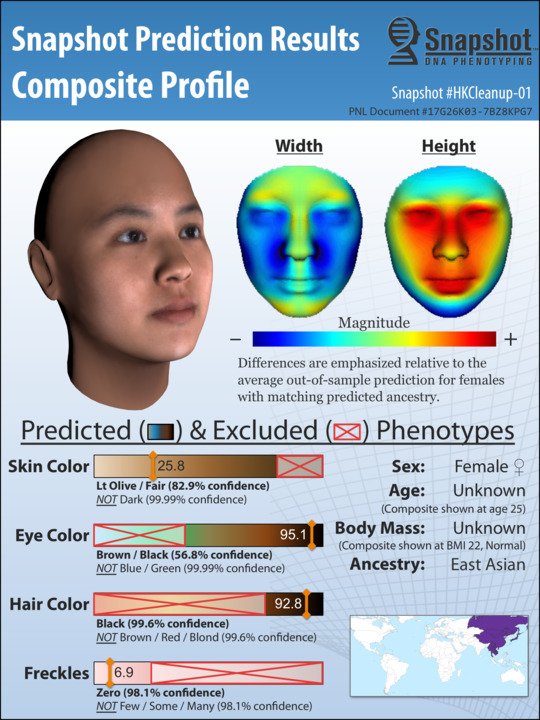 If more information is needed, we can optionally produce a detailed phenotyping report and composite sketch that includes eye color, skin color, hair color, face morphology, and detailed biogeographic ancestry. 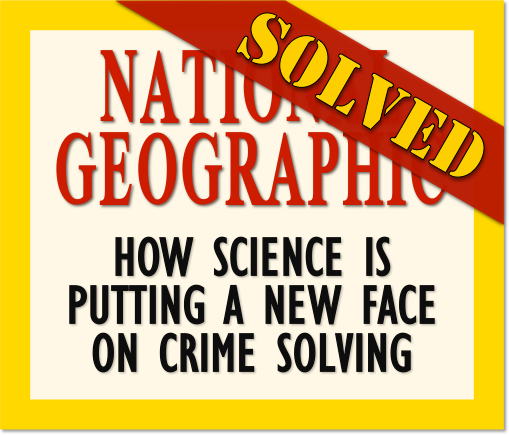 Armed with this scientifically objective information, you can conduct your investigation more efficiently and close cases more quickly. 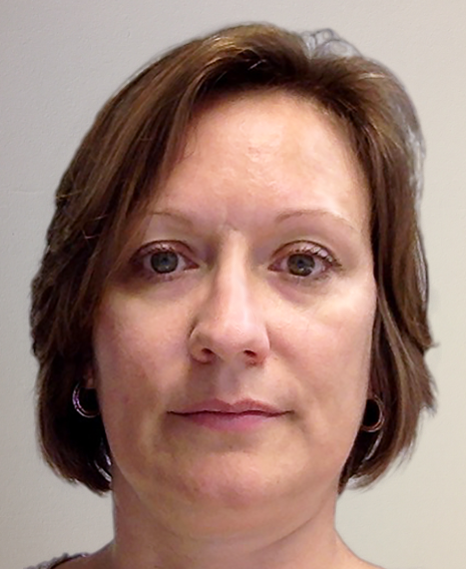 “The [Snapshot] training was highly informative and relevant to our work. 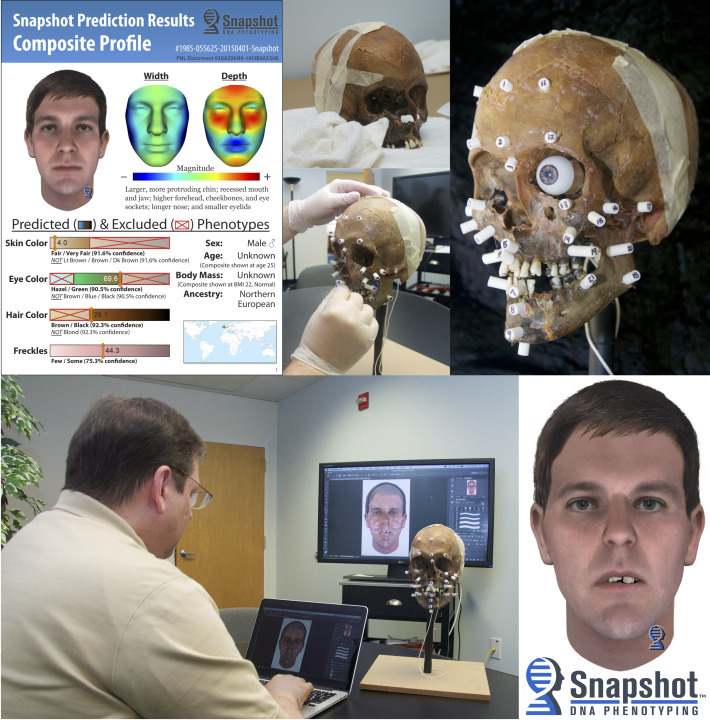 “Snapshot has fundamentally changed DNA forensics. 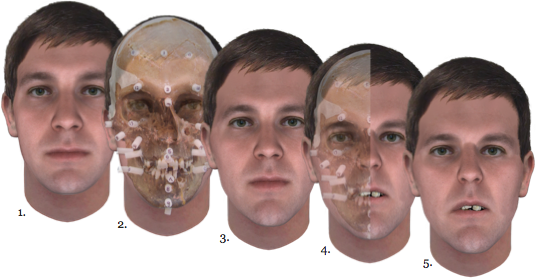 “Our clay models were subjective in terms of the victim's unknown physical characteristics. “You can see just what an amazing investigative tool Snapshot is. 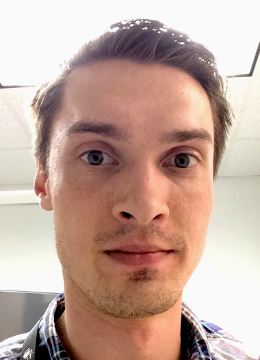 “[Snapshot] allows us to eliminate populations that we don't have to waste our energy on. Genetic Genealogy (GG) is the combination of genetic analysis with traditional historical and genealogical research to study family history. 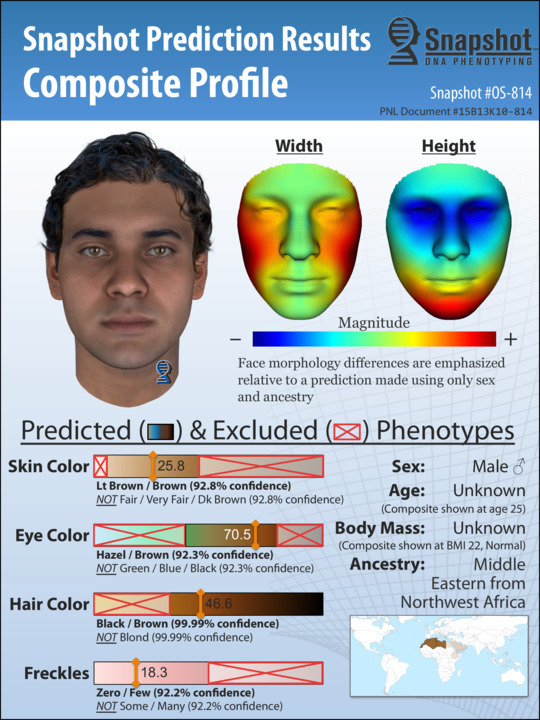 For forensic investigations, it can be used to identify remains by tying the DNA to a family with a missing person or to point to the likely identity of a perpetrator. 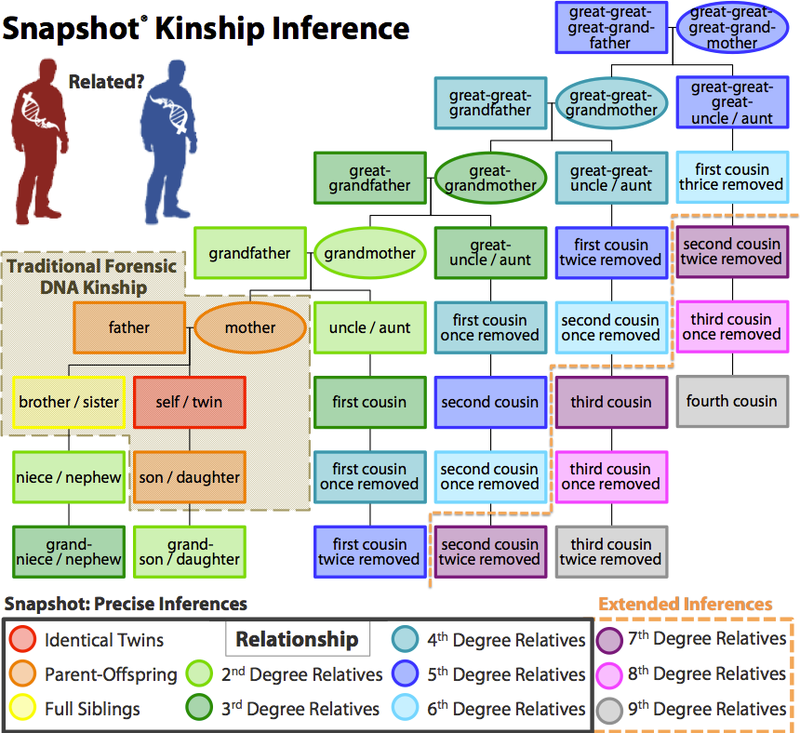 By comparing a DNA sample to a database of DNA from volunteer participants, it is possible to determine whether there are any relatives of the DNA sample in the database and how closely related they are (see Snapshot Kinship Inference for more details). This information can then be cross-referenced with other data sources used in traditional genealogical research, such as census records, vital records, obituaries and newspaper archives. Genetic genealogy gives you a powerful new tool to generate leads on unknown subjects. When a genetic genealogy search yields useful related matches to an unknown DNA sample, it can narrow down a suspect list to a region, a family, or even an individual. 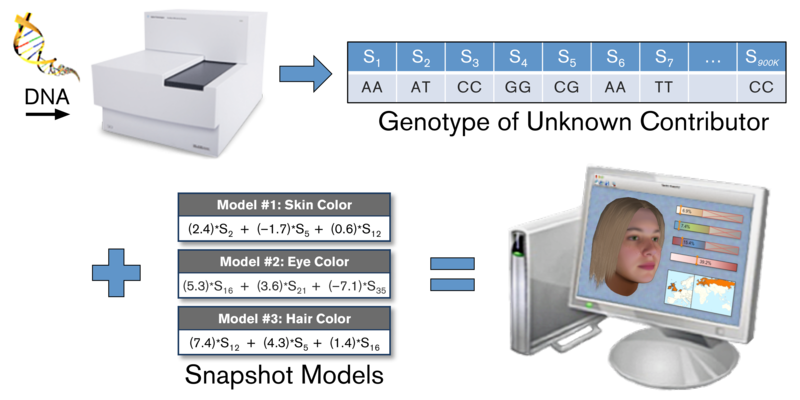 Paired with Snapshot DNA Phenotyping to further reduce the list of possible matches, there is no more powerful identification method besides a direct DNA comparison. 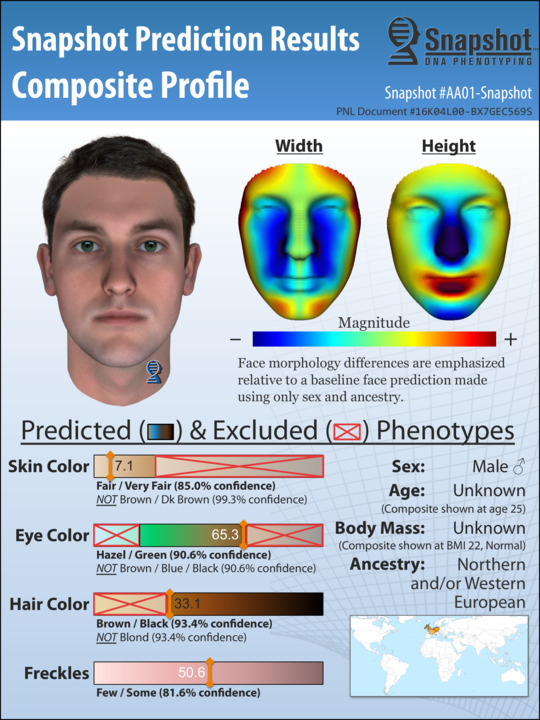 Identity can then be confirmed using traditional STR analysis. How Does This Technique Differ From Familial Searches in the CODIS Database? Our genetic genealogy service is somewhat like familial search, but it differs in three very important ways: (1) we only search public genetic genealogy databases, not government-owned criminal (STR profile) databases, such as CODIS; (2) because the DNA SNP profiles we generate contain vastly more information than traditional STR profiles, genetic relatedness can be detected at a far greater distance (see Snapshot Kinship Inference); and (3) because genetic genealogy matches can be cross-referenced by name with traditional genealogy sources, such as Ancestry.com, existing family trees can be used to expedite tree-building and case-solving. 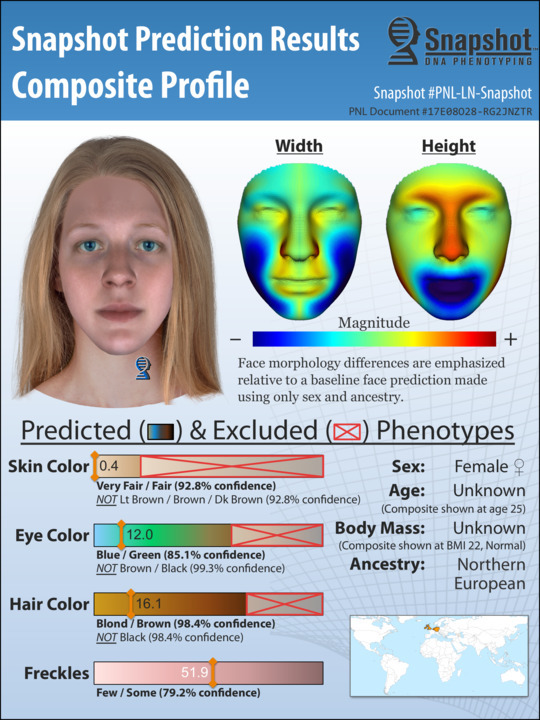 This technology and our innovative techniques combine to create a groundbreaking system for forensic human identification. Genetic genealogy uses autosomal DNA (aDNA) single nucleotide polymorphisms (SNPs) to determine how closely related two individuals are. Unlike other genetic markers, such as mitochondrial DNA or Y chromosome DNA, aDNA is inherited from all ancestral lines and passed on by both males and females and thus can be used to compare any two individuals, regardless of how they are related. 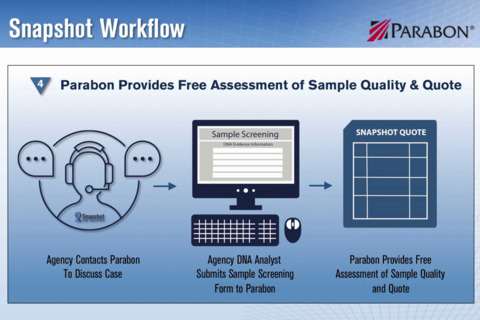 However, aDNA SNPs are more difficult to obtain from forensic samples, which is why Parabon has created an optimized laboratory protocol to ensure high-quality results even from small, degraded DNA samples. The standard aDNA metric used by genetic genealogists is the amount of DNA that two people are likely to have inherited from a recent common ancestor. 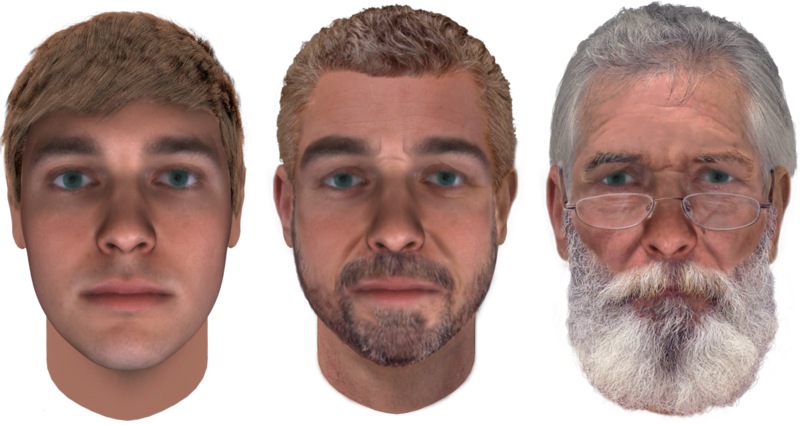 This can be estimated by looking for long stretches of identical DNA. While alleles can easily be shared by chance at one or a few SNPs, it is highly unlikely for two unrelated people to share a long stretch of DNA. Therefore, only segments above a certain length are counted. The length of these shared segments is measured in centimorgans (cM), a measure of genetic distance, and the total number of cM shared across all chromosomes can be used to determine approximately how closely related two people are. 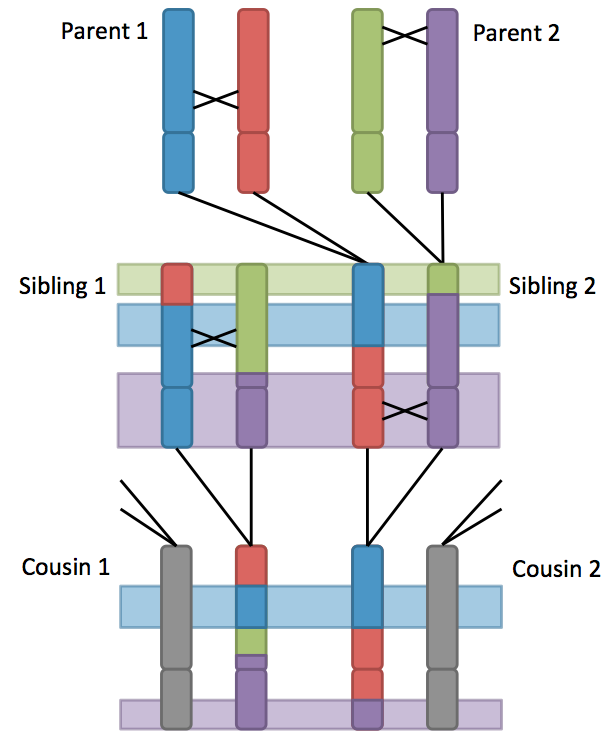 The figure below shows how shared segments of DNA on a single chromosome are broken up with each generation, leading to shorter shared segments for more distant relatives. Using a public genetic genealogy database, DNA from an unknown person can be compared to roughly 1 million other people to see whether any of them are related. DNA database matches serve as clues on which traditional genealogy methods can build, starting with building the matches' family trees using a wide variety of information sources. During the tree building process, the genetic genealogist searched for common ancestors who appear across multiple family trees of the matches. Ideally, marriages between the descendants of the identified common ancestors are discovered. Then descendancy research is employed to search for descendants at the intersection of these common ancestors who were born at a time that is consistent with the subject's estimated age range. 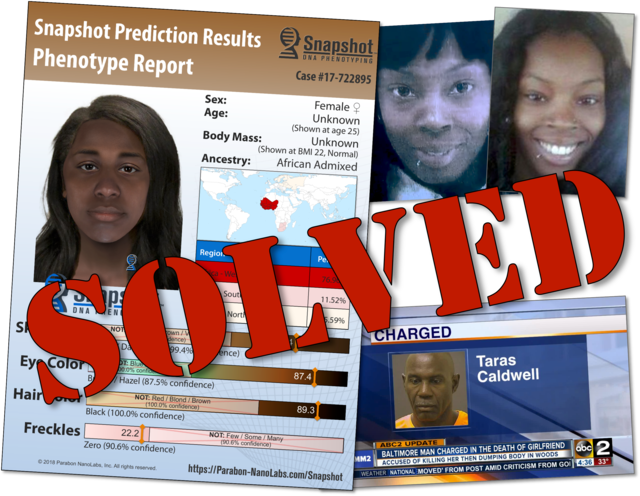 The goal of this search is to narrow down the possible individuals to a set of names, a family, or even an individual. The amount of information available can vary widely. In some cases, we have been able to produce names and contact information for distant and close relatives. In other cases, we have only been able to produce a small region in a US state from which the family of the person-of-interest originated. In some cases there will be no usable genetic genealogy data, rendering further analysis impossible, but continuous monitoring for future matches can be arranged. And, in some instances, we will be able to fully identify the person-of-interest. Genetic genealogy has traditionally been used to discover new relatives and build a full family tree. However, it can also be used to discover the identity of an unknown individual by using DNA to identify relatives and then using genealogy research to build family trees and deduce who the unknown individual could be. 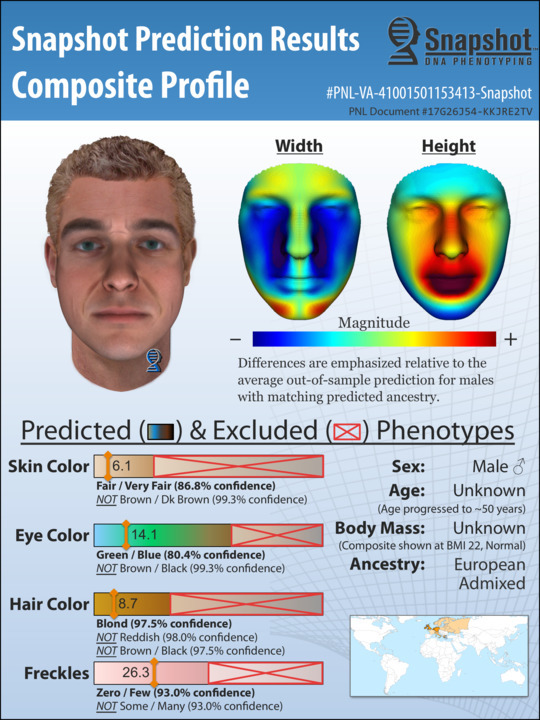 These techniques have primarily been used to discover the family history of adopted individuals, but they apply equally as well to forensic applications. 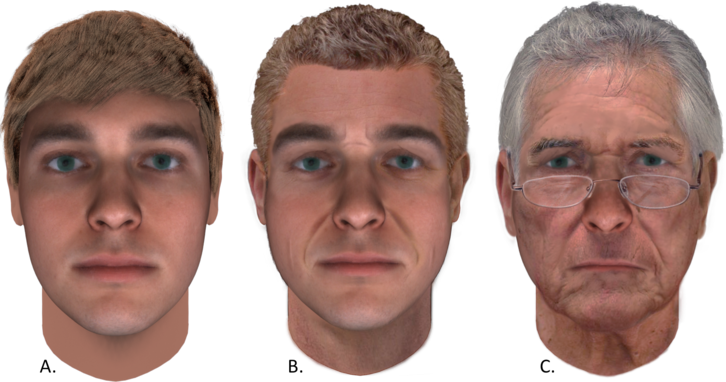 Genetic genealogy has been used to identify victims' remains, as well as suspects, in a number of high-profile cases. 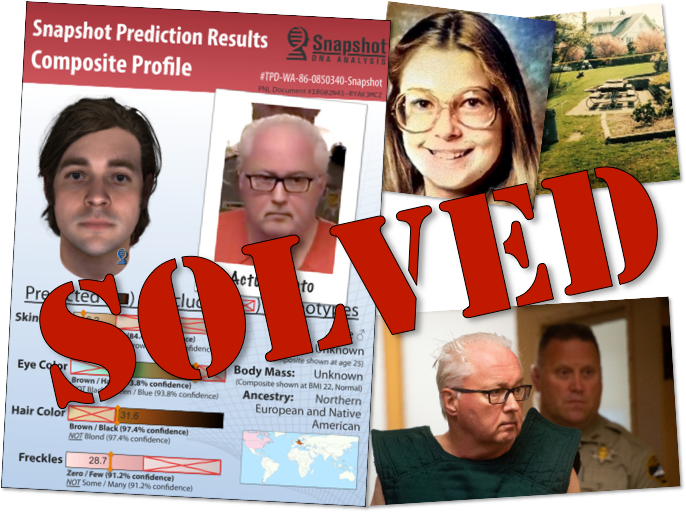 Most recently, genetic genealogy was used to zero in on a suspect in the Golden State Killer case. 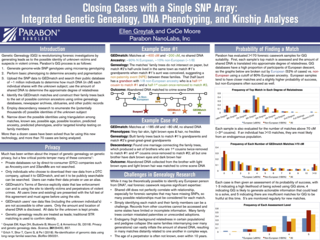 Because genetic genealogy uses the same type of data generated for Snapshot DNA Phenotyping and Snapshot Kinship, the analysis can quickly be performed on existing cases, and new cases have a wide array of options for generating new leads from a single DNA sample. 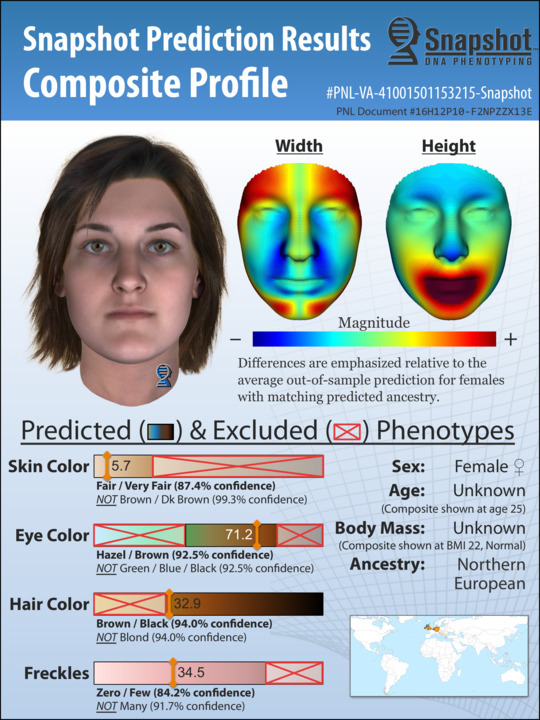 DNA Phenotyping is the prediction of physical appearance from DNA. 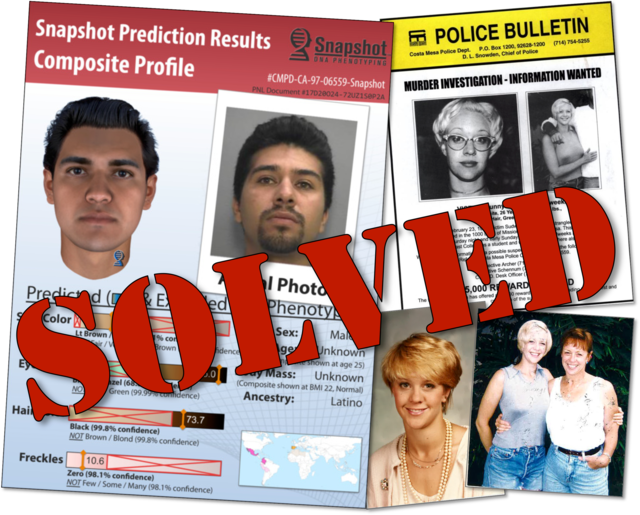 It can be used to generate leads in cases where there are no suspects or database hits, to narrow suspect lists, and to help solve human remains cases. DNA carries the genetic instruction set for an individual's physical characteristics, producing the wide range of appearances among people. 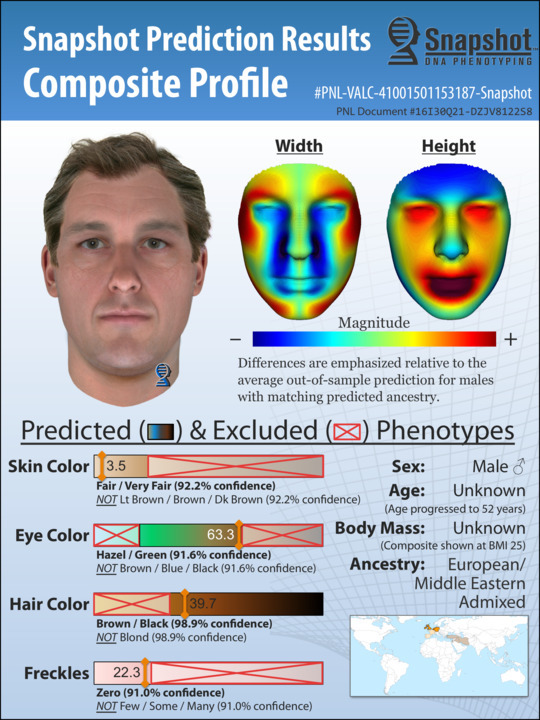 By determining how genetic information translates into physical appearance, it is possible to "reverse-engineer" DNA into a physical profile. Snapshot reads tens of thousands of genetic variants ("genotypes") from a DNA sample and uses this information to predict what an unknown person looks like. 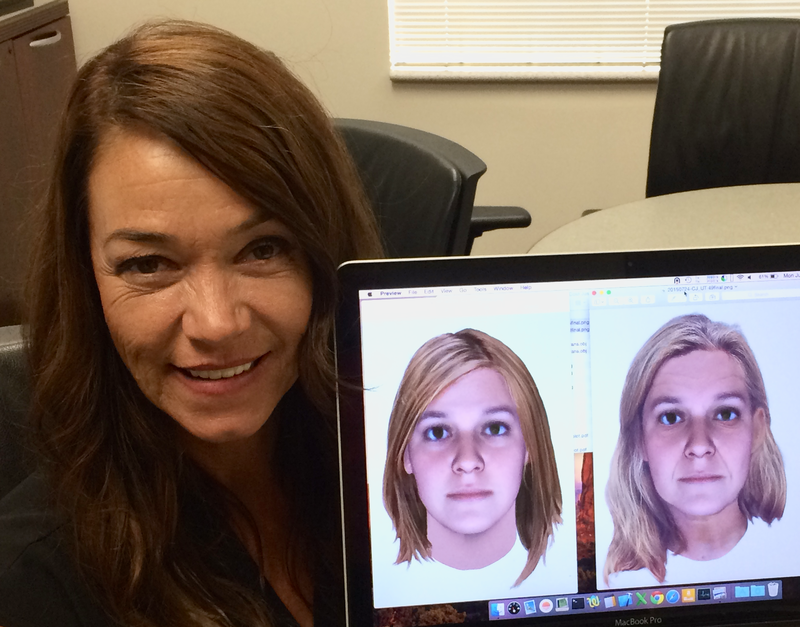 Whereas traditional DNA forensics matches STRs from a sample to a known suspect or a database, DNA phenotyping can generate new leads about an individual, even if they have not previously been identified in a database. DNA phenotyping takes advantage of modern SNP technology to read the parts of the genome that actually code for the differences between people. 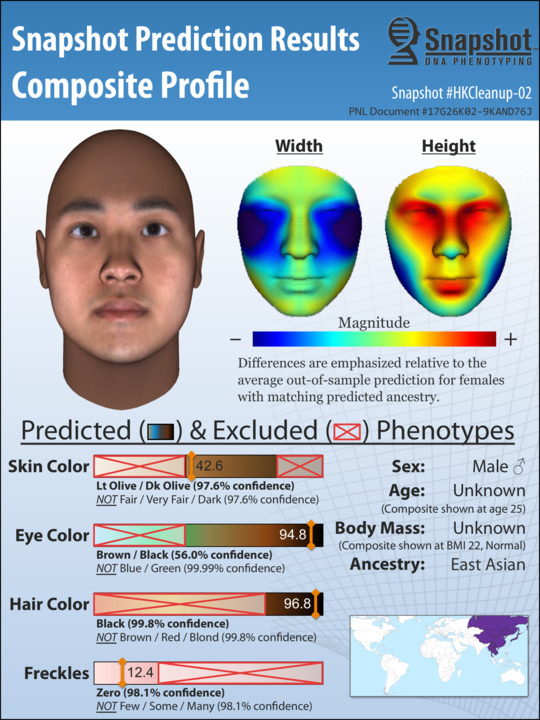 The Snapshot DNA Phenotyping System translates SNP information from an unknown individual's DNA sample into predictions of ancestry and physical appearance traits, such as skin color, hair color, eye color, freckling, and even face morphology. 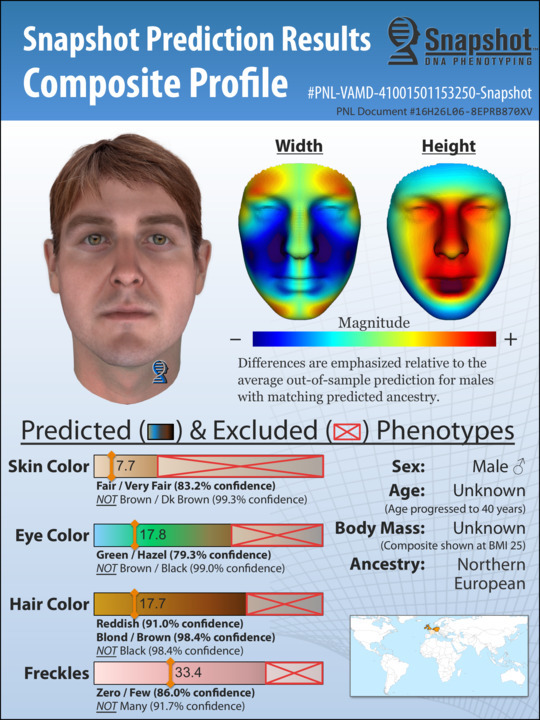 Each phenotype prediction is made with a measure of confidence, including those that can be excluded with high confidence. Recent advances in genomic technology have made it practical and affordable to read the sequence of millions of pieces of DNA from a small quantity of sample. 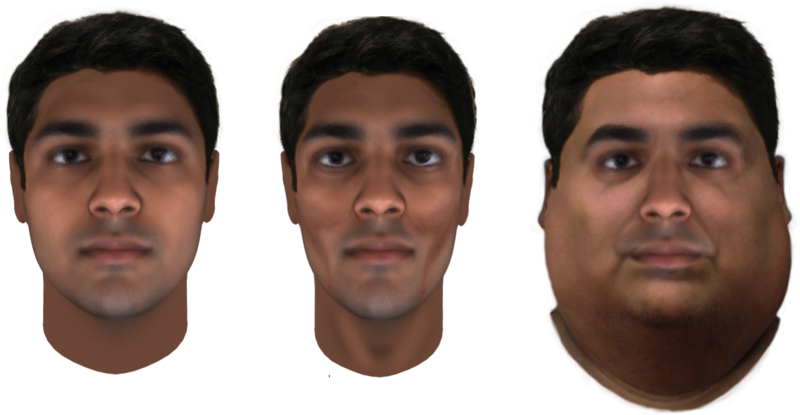 This data captures a large proportion of the genomic variation between people and thus contains much of the genetic blueprint that differentiates people's appearance. These SNP genotypes can then be paired with phenotypes from thousands of subjects to create a genotype-and-phenotype (GaP) dataset for analysis. 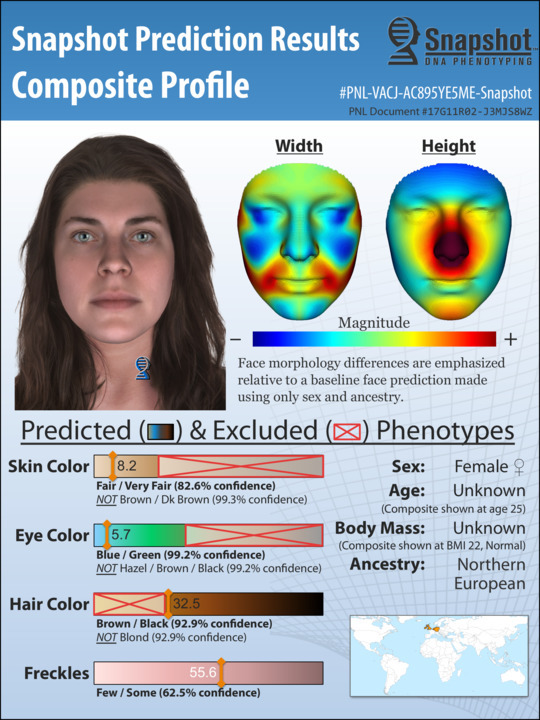 Using genomic data from large populations of subjects with known phenotypes, Parabon's bioinformatics scientists have built statistical models for forensic traits, which can be used to predict the physical appearance of unknown individuals from DNA. Beginning with large GaP datasets containing genetic information and measures of phenotype for thousands of subjects, Parabon's bioinformatics team performs large-scale statistical analysis on hundreds of thousands of individual SNPs and billions of SNP combinations to identify genetic markers that are associated with a trait. This mining process can take weeks of compute time running on hundreds, sometimes thousands, of computers. In the end, those SNPs with the greatest likelihood of contributing biologically to the trait's variation are selected for potential use in predictive models. 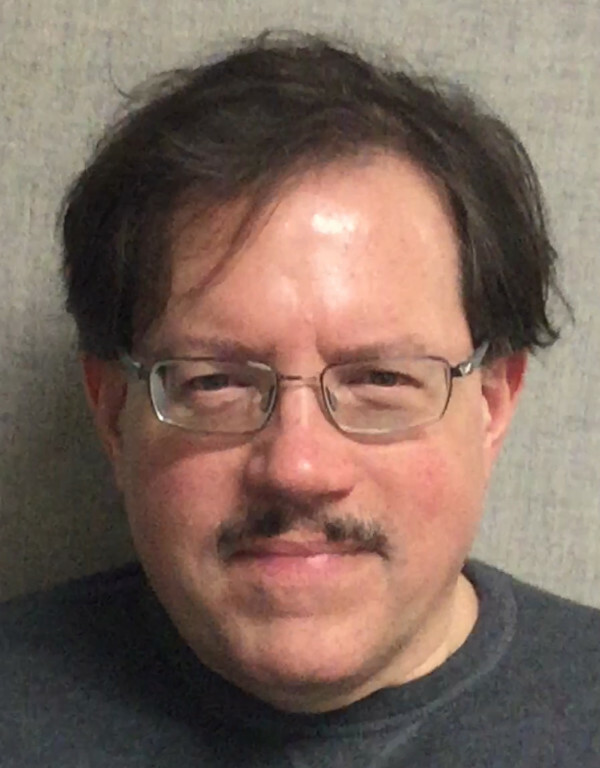 In the modeling phase, Parabon's scientists use machine learning algorithms to combine the selected set of SNPs into a complex mathematical equation for the genetic architecture of the trait. A new, unknown individual's SNP data can then be plugged into this equation to produce a prediction of the trait in that individual. Model accuracy is assessed by making predictions on new subjects with known phenotypes ("out-of-sample predictions"). By comparing predicted versus actual phenotypes, Parabon scientists are able to calculate confidence statements about new predictions and, more importantly, exclude highly unlikely traits. For example, if 99% of brown-eyed people have an eye color prediction value greater than 2, then we can have very high confidence that a prediction of 1.5 most likely did not come from a brown-eyed person. The final models are calibrated with all available data before being installed into the Snapshot production service that is used to generate phenotype predictions for investigators. 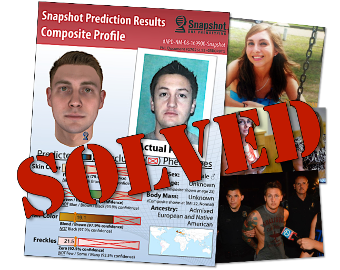 Snapshot has been used by hundreds of law enforcement agencies around the world to help generate leads, narrow their suspect pools, and solve human remains cases, in both active and decades-old investigations. On Wednesday 26 March 1986, Michella Welch, a petite 12-year old girl with long blond hair and glasses, went missing. She had taken her two younger sisters to Puget Park in Tacoma, Washington at about 10 a.m. and then rode her bicycle home about 11 a.m. to make lunch for them. 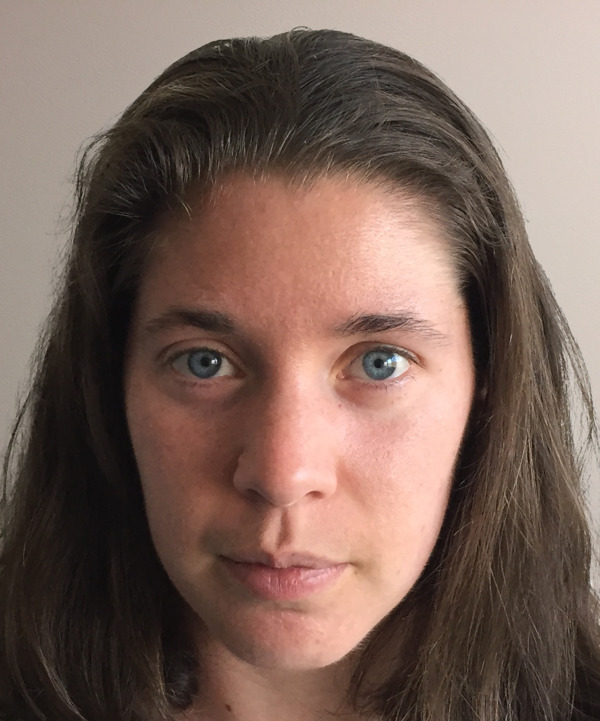 When she returned, she chained her bike next to one of her sister's bikes, set the lunches on the table and went looking for her siblings, who had gone to a nearby business to use the restroom. Just before noon on 11 September 2008, Diane Marcell returned to her home in Albuquerque, NM, to meet her daughter, Brittani Marcell, for lunch. Brittani, then 17 years old, had driven home from her nearby high school. Upon entering her home, Diane found Brittani lying on the floor, covered in blood. A male subject, unknown to Diane, was standing near Brittani holding a shovel. In the early hours of 4 Feb 2012, Troy and LaDonna French were gunned down in their home in Reidsville, NC. The couple awoke to screams from their 19-year old daughter, Whitley, who had detected the presence of a male intruder in her second floor room. As they rushed from their downstairs bedroom to aid their daughter, the intruder attempted to quiet the girl with threats at knifepoint. Failing this, he released Whitley and raced down the stairs. 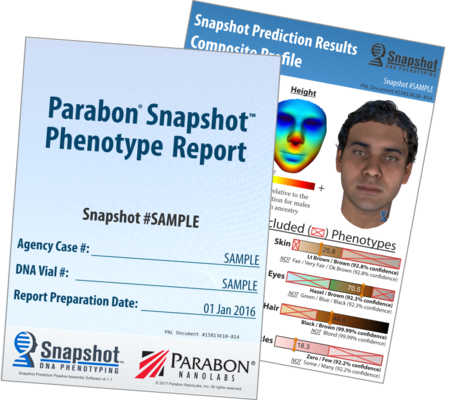 Blind Evaluations: Snapshot was built by Parabon NanoLabs for the defense, security, justice, and intelligence communities with funding from the United States Defense Threat Reduction Agency. As part of the development and validation process, Snapshot was tested on thousands of out-of-sample genotypes and was shown to be extremely accurate. Scientific analysis of human genomes from different parts of the world has shown that, on a global scale, modern humans divide genetically into seven continental populations: African, Middle Eastern, European, Central/South Asian, East Asian, Oceanian, and Native American1. 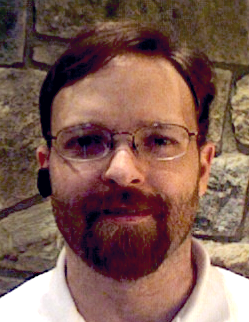 These genetic divisions stem simply from the fact that these groups were isolated from one another for many generations, and thus each group has a unique genetic signature that can be used for identification. 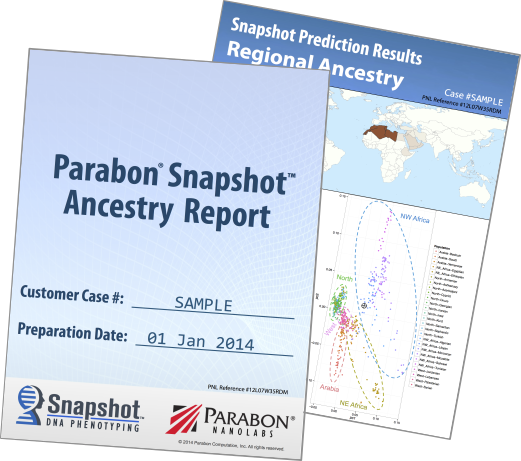 In order to determine a new subject's genetic ancestry, Parabon Snapshot analyzes tens of thousands of SNPs from a DNA sample to determine a person's percent membership in each of these global populations. Other forensic ancestry approaches assume that every individual comes from only a single population, so they can easily be confounded by admixed individuals, but Snapshot allows for contributions from multiple populations, so it can detect even low levels of admixture (<5%). Global ancestry map showing mostly East Asian and Native/South American ancestry, with some European ancestry as well. After global ancestry is determined, Snapshot's ancestry algorithm investigates which subpopulations (e.g., Northwest vs. Northeast Europe) an individual comes from. This analysis is robust to admixture, such that each piece of continental ancestry can be precisely localized within that continent. For example, the admixed East Asian and Latino example from the global map above was determined to have specifically Japanses, Central American, and Southwest European ancestry, as shown in the map below. Regional ancestry map showing mostly Japanese, Southwest European, and Central American ancestry. 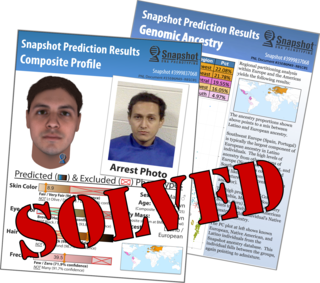 Using all of this information, Snapshot builds a precise profile of an individual's ethnic ancestry using only his or her DNA. 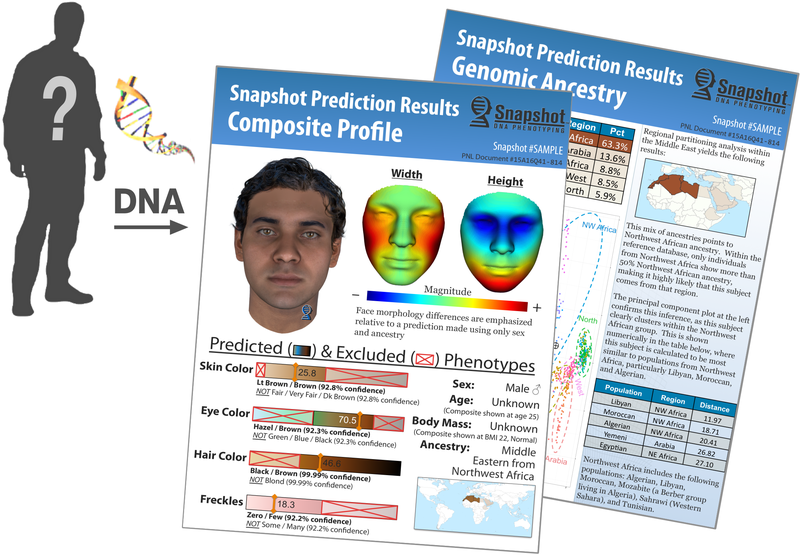 Parabon has built a powerful system for determining ethnic ancestry from DNA. Most other forensic ancestry systems use only a small number of SNPs and thus are limited to very coarse populations and cannot detect admixture between populations. Snapshot uses tens of thousands of SNPs across the genome to obtain very precise estimates of ancestry, even for admixed individuals. Parabon's scientists have collected data from many published scientific articles, totalling more than 9,000 individuals with clearly defined ancestry from more than 150 populations around the world, as shown in the map below. 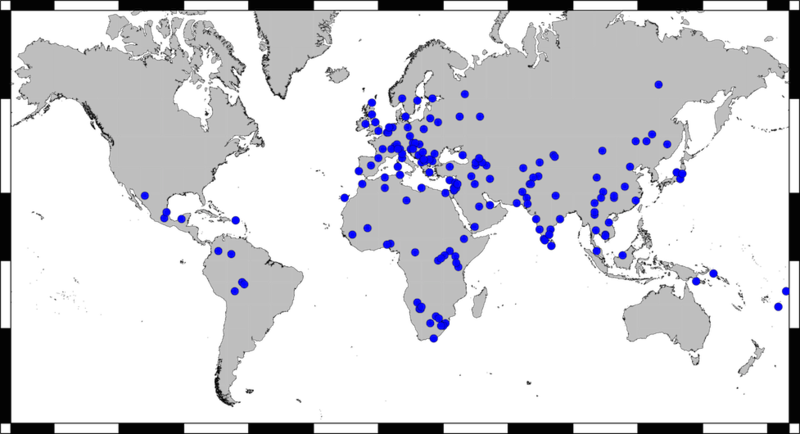 Each point represents a population from which we have obtained ancestry background data. Efforts are ongoing to increase the representation of Native American populations. Academic research using hundreds of thousands of SNPs from across the genome has shown that human groups generally divide into seven continental populations, which have been established over the past 50,000 years during the migration out of Africa. The 150 populations collected as the ancestry background can thus be divided into these seven continental groups according to their origin. Snapshot builds on this research by mapping a new person's genome onto these established populations. Our algorithm calculates how similar the new individual's DNA is to each of the background populations, determining which population(s) the person comes from. This allows for contributions from multiple groups, so even small amounts of admixture (<5%) can be detected. Snapshot takes a similar approach to identifying within-continental (regional) ancestry, although the local populations were identified through empirical analysis performed by our bioinformatics team. Each piece of continental ancestry is partitioned according to its regional ancestry (e.g., if an individual is 50% European and 50% East Asian, the precise origin of each of those pieces will be determined). The person's genome is also plotted against all of the known individuals in each region to show visually where he or she falls. 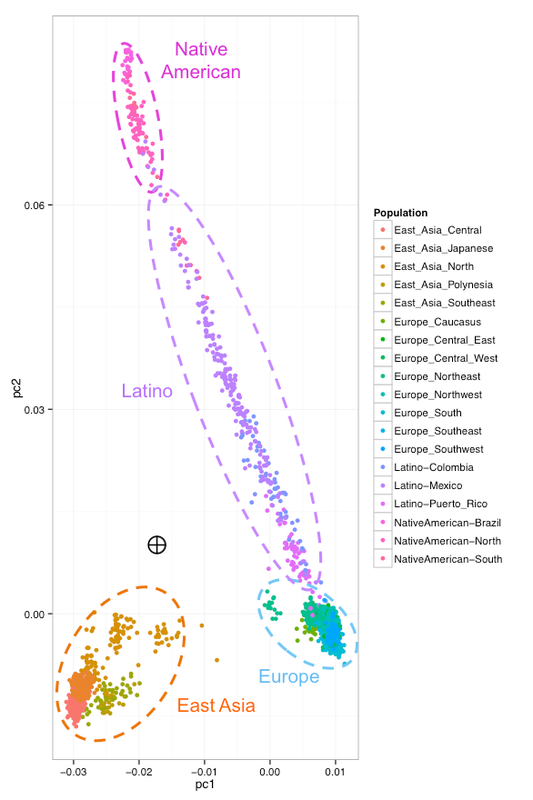 Below is an example plot for an individual who was determined to be 50% East Asian and 50% Latino. Latino ancestry is a mixture of European and Native American ancestry, so these groups are shown as well. Ancestry clustering diagram; this individual is half Japanese and half Latino. Ethnic ancestry is one of the most informative traits that can be predicted from DNA. In an ancestry analysis, Snapshot will determine an individual's precise genetic origins, as well as whether there is any evidence of admixture (contribution from multiple populations). 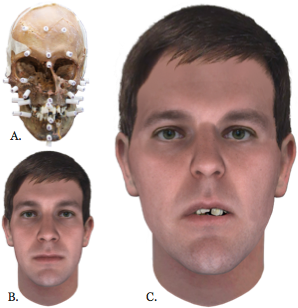 This information can be used to help identify remains or to significantly focus an investigation by excluding a wide range of possible suspects or even pointing to a very small group.